Infiniti has announced it is developing a new electrified vehicle platform based on the Q Inspiration concept car that was revealed back in January this year. The new architecture will be used for a new sedan set to debut in the future, which is one of five vehicles the carmaker plans to build in China over the next five years. “Infiniti is developing a new platform for electrified vehicles inspired by the Q Inspiration concept car, which shows the new design language for the age of autonomy and electrification. We very much had China in mind when designing the Q Inspiration, which shows a very sporty, performance-oriented electric concept, with a much bigger interior space,” said Infiniti chairman and global president Roland Krueger. 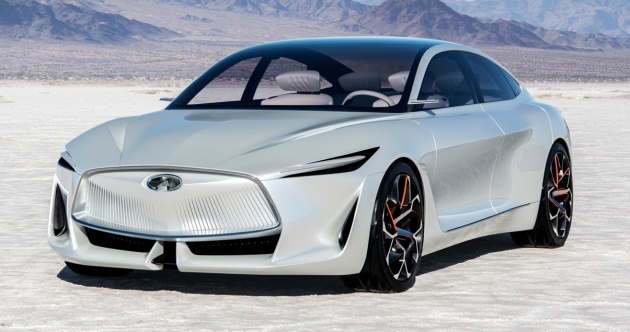 While the platform being developed will accommodate electrified powertrains, Infiniti didn’t say which type will be employed on its upcoming sedan. Available options include hybrid, plug-in hybrid, fully electric and range extender powertrains. At the time, the concept was powered by a VC-Turbo engine with the brand’s variable compression ratio technology, albeit without any electrification. The four-door concept also showcased the future of Infiniti’s design language, which has been simplified to features clear and concise lines coupled to dynamic proportions. The interior also adopts a minimalist approach with screens covering quite a number of areas inside the cabin. “The Q Inspiration concept car takes the traditional sedan architecture to its next stage of evolution. A shift towards smarter, more compact and less intrusive powertrains; We were able to create an alternative form with flowing gestures, more engaging in character and more enriching in experience. With its long cabin, balanced proportions and muscular stance, the concept heralds in a new era for Infiniti models,” noted Karim Habib, executive design director at Infiniti. As mentioned earlier, a sedan based on this new platform will be introduced later on, and will be manufactured in China at a location to be announced later. The carmaker currently operates in China via a partnership with Dongfeng Motor Company, and sold 48,408 cars in the country last year, a 16% increase from 2016. Welcome this new Infiniti to the Tesla and Polestar club.